Last night Hallie and I watched President Obama’s eloquent and moving speech at the interfaith prayer vigil for those killed in the Sandy Hook Elementary School shootings. About halfway through, when Obama discussed our nation’s collective responsibility to our children, a certain cognitive dissonance popped into my head – a pesky, but familiar distraction that remained with me for the rest of the speech. Obama concluded by reciting the first name of each of the 20 children killed. When it was over we both sat silently looking at the screen. “Don’t say it, just don’t say it” I thought to myself. “What did you think?” she finally asked me. Then Moore flashes the words “One Hour Later” and there’s Clinton again: “We all know there has been a terrible shooting at a high school in Littleton, Colorado.” Moore’s point was clear: there is an important connection to be made between our killing of Serbian civilians and the killing of students in Columbine. So too, I believe there is a similar connection between the killing of innocent children in Newtown to the killing of innocent children in Pakistan. Both are the product of a uniquely American culture of violence, insecurity and fear – and both are the consequences of a national penchant for manufacturing, selling and profiting from ever more sophisticated weapons of death. Might it be that our Constitutional right to bear arms reflects a national sense of entitlement to create and sell weapons and to use them wherever and whenever we see fit? And if so, might we be ready to limit this right for the sake of our children both here and around the world? Would that our President would ask himself that very question before he approves his next drone strike. This entry was posted in Children's Rights, Gun Control, Movies, Politics, War on December 17, 2012 by Rabbi Brant Rosen. The rebellion does not go well for Korach, to put it mildly – at the climax of this episode, the earth opens up to swallow him, his followers, their families and all of their possessions. One of the most common issues folks have with this troubling story has to do with the “collateral damage.” Even if we assume (as many commentators do) that Korach and his followers were self- serving charlatans who deserved what they got in the end, why on earth did their “wives, their children, and their little ones” have to be swallowed up as well? It is ironic that Korach, who purports to have the good of the people at heart, ends up destroying them. Indeed, though he speaks the rhetoric of the masses, his actions ultimately lead to a tragedy of massive proportions. In this regard we might claim that Korach’s primary failing was not hubris per se, but his willingness to let his zealous attachment to a single principle endanger the safety and well-being of his community. 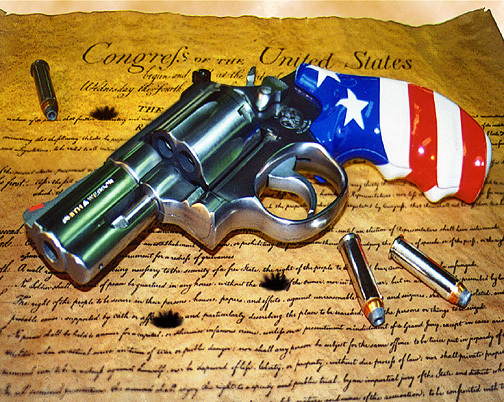 This lesson has particular relevance this Shabbat, coming as it does one day after the US Supreme Court struck down a gun-control law in Washington DC, ruling that the Second Amendment protects the right to possess a firearm unconnected with militia service and to use it for “traditional lawful purposes.” It is clear that this landmark ruling – the first time in 70 years that the High Court has ruled on the Second Amendment – will lead to widespread challenges to gun control laws across the country. There already is a national glut of firearms: estimates run between 193 million and 250 million guns. The harm they do is constantly on heartbreaking display. Thirty-three dead last year in the shootings at Virginia Tech. Six killed this year at Northern Illinois University. On Wednesday, as the court was getting ready to release its decision, a worker in a Kentucky plastics plant shot his supervisor, four co-workers and himself to death. I have written before on the importance of gun control from a Jewish perspective. According to halacha, pikuach nefesh – the preservation of life – is the most sacrosanct commandment, taking precedence over all other commandments, obligations, or even “rights” (as we would say here in America). As such, I would argue that gun control is a critical spiritual imperative for our national community. If you agree, check out the Brady Campaign for more info and actions you can take in the wake of this latest ominous ruling. This entry was posted in Gun Control, Judaism, Religion, Torah Commentary on June 27, 2008 by Rabbi Brant Rosen. In my commentary on these verses last year, I suggested that Simeon and Levi represent the Torah’s paradigm for unchecked, unmitigated violence. This past week, we received the good news that our nation had made one small step toward alleviating Simeon and Levi’s legacy from our midst. In the spirit of this week’s Torah portion which disavows “tools of lawlessness,” let’s call President Bush at 202.456.1111 and urge him to sign the NICS Improvement Act immediately. Chazak, chazak, Ve’nitchazek: May our shared resolve strengthen us to create a world of justice, safety, and peace. This entry was posted in Current Events, Gun Control, Judaism, Politics, Religion, Torah Commentary on December 21, 2007 by Rabbi Brant Rosen. In the end, I believe the path set out for us by our tradition guides us still. The violence in our midst cannot be ignored or wished away. We must acknowledge it, we must face it, and yes, we must respond to it. For our own sake, for the sake of all who dwell on earth, we must disavow the use of violence to solve our conflicts. Whether it be the violence in our own homes, or the use of military force to address complex political situations, we must be ready to confront and repudiate the violent impulses that reside deep within each and every one of us if we are ever to find a way toward a truly just and peaceful world. This entry was posted in Gun Control, High Holidays, Judaism, Nonviolence, Peace, Religion, Sermons on September 25, 2007 by Rabbi Brant Rosen. The young man who killed 31 people at Virginia Tech was a paranoid delusional psychotic. But there is something equally sick about a society that allows such a person to walk into a gun shop and buy two deadly firearms as easily as he would a candy bar. According to my spiritual tradition, the most sacrosanct religious value is something we call Pikuach Nefesh – “Saving a Life.” Pikuach Nefesh means that saving lives is absolutely paramount in our world. Halacha, or Jewish law, stipulates that Pikuach Nefesh trumps virtually every commandment, obligation (or even “right,” as we would say in America.) Yes, it might be argued that according to this principle handgun ownership is a personal safety issue – but on a much more fundamental level, it also means that gun control is an absolute necessity in order to keep guns out of the hands of those who might present a threat to public safety. (Because) a gun is a dangerous object, halacha (like many current gun control laws) requires that owners and vendors of guns take all possible precautions to prevent their guns from causing any harm. Even by this benchmark, our nation’s gun control laws are failing us miserably. In Virginia, it is easier to obtain a Glock than it is to get a driver’s license. Like many illnesses, this national sickness of ours’ only manages to catch our attention when it actually presents itself in an overt way. Shame on us. Shame on us that even though over 10,000 people die every year in our country from gun inflicted homicides, it has taken a singular tragedy of such proportions to put this epidemic back in the national spotlight. The answers are as plain to us as they have always been. We know that there is much we can do to keep guns out of the hands of people such as Cho Seung-Hui. Please, please visit the websites of the Coalition to Stop Gun Violence or the Brady Campaign. It will give you more information about how you can easily contact our nation’s leaders and contribute to a real and lasting solution. For the sake of Pikuach Nefesh, it’s time to treat our national sickness once and for all. This entry was posted in Current Events, Gun Control, Politics, Religion on April 19, 2007 by Rabbi Brant Rosen.